I’m polishing off this cool, refreshing Chardonnay in the waning moments of tonight’s cocktail hour. Hiding as it was in the bottom of the fridge, partially consumed from some previous evening, this 2013 Kendall-Jackson has lost a bit of its crisp, fresh tone but still pulls a smile from my weary face. 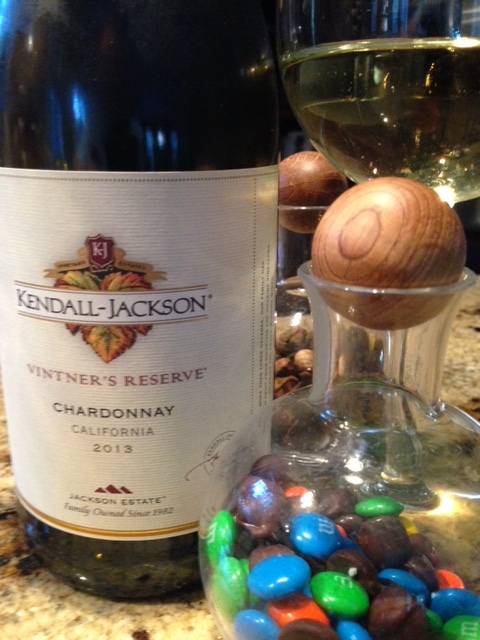 2013 Kendall-Jackson Vintner’s Reserve Chardonnay, California, USA. Pear is present and accounted for, as is a nice easy finish that is hinting at a possible turn in the near future. Fortunately, she’s been liberated from the bottle just in time. The 2013 Kendall-Jackson Vintner’s Reserve Chardonnay will accompany grilled tuna steaks, seasoned with lemon and a Mediterranean spice mix, white rice, and medley of scallions and mushrooms. Very promising stuff. The Kendall-Jackson family always makes a good effort, and I’m sure this is one too. Excuse the brevity; the next time around we’ll be sure to polish with less of an interval between tastings and look forward to sharing those findings with you. This entry was posted in Chardonnay and tagged $10-$15, California, california winemaking.